In order to be heard and counted on Election Day, eligible citizens must be registered to vote. Send this eCard to the people in your life who may need to register to vote or update their registration, including those who recently turned 18, became a citizen, moved or changed their name. 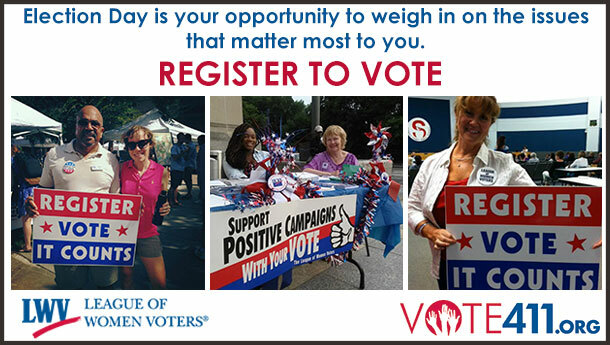 In order to be heard and counted on Election Day, eligible citizens must be registered to vote. Use www.VOTE411.org to register to vote or update your voter registration, for example if you’ve moved or changed your name! NOTE: In most states, if you don’t print out and mail in your form, you are not finished registering to vote. In most states, you’ll need to make sure you have printed, signed and dated your completed voter registration form. Then, stamp it and put it in the mail to be sent to the official’s address that was pre-filled on your form. Voting brings us together as Americans – it doesn’t matter if you’re rich or poor, young or old; it is the one time when we are all equal. These elections are about our jobs, our health, our communities, our security and our future. They’re about us and we all need to weigh in. Together, through our votes, we can take control of this election. VOTE411.org will provide you with the information you need to cast your ballot, including important deadlines to remember and information regarding in-person and absentee voting.